Buy the perfect starter kit today! The O+ Elevate Pack includes 1 reusable, refillable O+Shell and 2 starter refills – Natural and Peppermint or Pink Grapefruit. Swap the two flavors back and forth. So easy to reload, it's just like changing batteries in a flashlight. When depleted, simply load in a fresh refill. The O+ Elevate Pack weighs ~ 0.5 lbs. (226 gr.). Refills are recyclable and additional refills are available in 3-packs and 6-packs in every scent. 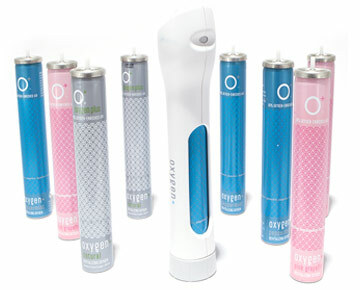 Each refill canister contains over 50 breaths of 95% enriched oxygen. The flavors in O+ products are food- and beverage-grade flavors approved for use by the FDA and the Food Extract Manufacturing Association. Get your breath on with an O+ Elevate Pack!